Trump's parents and siblings: What do we know of them? President Donald Trump's family are once again in the spotlight, but this time it is his parents and siblings rather than his children. 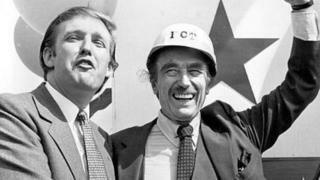 A New York Times' investigation says it has found evidence that Mr Trump's property mogul father Fred dodged millions of dollars in taxes with often dubious strategies that channelled his wealth to his five children. It also accuses Donald Trump and his siblings of "setting up a sham corporation to disguise millions of dollars in gifts from their parents" - accusations denied by Mr Trump's youngest brother, Robert. So what do we know of Fred, his wife Mary Anne and their five children - the fourth of whom is now president of the United States. Frederick Christ Trump was born in New York in 1905 to German immigrants, Elizabeth Christ and Frederick Trump. His father had already invested in real estate, and Fred soon followed in his footsteps - founding a company initially under his mother's name as he was still under age. He made his fortune by building affordable housing for middle-income families along the US east coast during and after World War Two. Many of these projects were government-subsidised, and he was forced to appear before the US Senate in 1954 amid allegations he had been profiteering from the contracts. In the 1970s, he was accused of discriminating against minorities by refusing to allow black people and Puerto Ricans to rent his properties. A civil rights case was brought against him, and it was Donald Trump who became a regular in newspapers with his fierce defence of his father. The case was eventually settled without any admission of wrongdoing. It is worth mentioning Fred's younger brother, John, who has been name-checked many times by his famous nephew. John Trump was a professor of engineering at the elite Massachusetts Institute of Technology for 44 years, whose work led to advances in cancer therapy and nuclear research. Who was Trump's nuclear Uncle John? Mary Anne MacLeod was just 18 when she first arrived in New York, having travelled from her home on the Scottish island of Lewis in search of domestic work. Six years later, she married Fred and moved with him to a wealthy area of Queens where she became active with charity work and raised their five children. She became a US citizen in 1942. Mary Anne Trump died at the age of 88 in 2000, little more than a year after her husband Fred passed away. The oldest child, Maryanne Trump Barry is best known as a senior judge of the US Court of Appeals for the Third Circuit, although she took an inactive status in February 2017 soon after her brother became president. She was nominated to the post in 1999 by President Bill Clinton, and before that was picked by Ronald Reagan as District Judge for New Jersey in 1983. Now 81, Maryanne is said to be close to her brother Donald. She once told the story of how he had visited her every day she was in hospital following an operation. "Once would have been enough - the duty call. That's how love shows, when you go that extra yard." She also said she "knew better even as a child than to even attempt to compete with Donald". Though she is regarded as a Republican, she has expressed views supporting abortion rights and immigration. She has one son with her first husband. Her second husband, John Barry, also a lawyer, died in 2000. Fred Jr was the second oldest of the siblings, and eight years older than Donald. He was initially destined for the family business, but after a spell working with his father, Fred Jr left to become a pilot. Married with two children, Fred appeared to have it all but it became apparent by his mid-20s that he had problems with alcohol, according to a New York Times article from 2016. "The years that followed were unkind. He got divorced, quit flying because he knew his drinking presented a danger and failed at commercial fishing in Florida. By the late 1970s, he was living back in his parents' house in Jamaica Estates, working on one of his father's maintenance crews," the article said. President Trump has said it was watching the descent of his brother that made him determined never to drink alcohol, take drugs or smoke cigarettes. "He had a profound impact on my life, because you never know where you're going to end up," Mr Trump said. "[Fred] was a great guy, a handsome person. He was the life of the party. He was a fantastic guy, but he got stuck on alcohol." The third sibling and some four years older than the president, Elizabeth is more private than her other siblings. She is a retired banker, married to the film producer James Grau. Robert is the youngest of the five siblings, born two years after Donald. Like his brother, he spent much of his career with the family firm, becoming a top executive. Unlike his brother, he is said not to court publicity and prefers a quieter life, now semi-retired in New York state. He responded to the New York Times' latest allegations by insisting: "All appropriate gift and estate tax returns were filed, and the required taxes were paid." Who are the next generation of Trumps?